Do you have difficulty breathing at night? Maybe you have been diagnosed with sleep apnea? If so, your dentist, Dr. Tad Morgan, offers treatment for sleep apnea in Bullard. 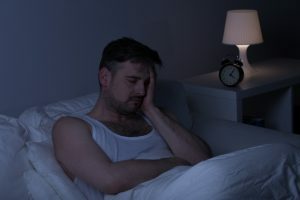 The most common form of sleep apnea is known as obstructive sleep apnea, which results when an obstruction in the airways causes breathing to pause. These pauses in breathing can occur hundreds of times per night with each episode potentially lasting a minute or more. When left untreated, sleep apnea leads to serious overall health complications. Not to mention, your sleep quality takes a toll, drastically decreasing your quality of life. As your dentist, Dr. Morgan offers the treatments you need to breath better and sleep better. It is estimated, roughly one in six people over the age of 50 have a form of sleep apnea. In addition, it is estimated roughly 75 percent of those with severe sleep apnea remain undiagnosed. These startling statistics are quite frightening because untreated sleep apnea can cause serious and potentially deadly complications. When the soft tissues of the throat collapse, the airways are narrowed, causing breathing to stop. These pauses in breathing occur numerous times per night. As a result, the lack of oxygen places extra strain on the heart. Over time, this has shown to lead to cardiovascular complications. Not to mention, the pauses in breathing often cause sleep quality to diminish. Over time, the lack of adequate sleep will lead to sleep deprivation. As sleep deprivation sets in, your quality of life significantly decreases and performing simple, everyday tasks becomes more challenging. To be diagnosed with sleep apnea, you will first need to undergo a sleep study. Dr. Morgan offers an at-home sleep apnea study. The information gathered from the study is analyzed to create a treatment plan. Once you have been properly diagnosed and have a prescription for treatment, Dr. Morgan is able to provide the appropriate course of treatment to keep the airways open. As a result, the pauses in breathing will be prevented—protecting your health and quality of life. Dr. Morgan offers oral appliance therapy to treat sleep apnea. The device is similar to an athletic mouthguard, which is worn at night. The device repositions the lower jaw to help keep the airway open. While a CPAP machine is most known for treating sleep apnea, many have come to prefer the oral appliance. The appliance is discreet and convenient while also allowing for added comfort to help you sleep soundly. If you are exhibiting the signs of sleep apnea or have recently been diagnosed with the condition, you need to seek treatment. Dr. Morgan will help you treat your individual case of sleep apnea by ensuring you are breathing properly. As a result, you will protect your health from complications while gaining a restful night’s sleep. Let Dr. Morgan help you breath and sleep better. Contact Dr. Morgan today to schedule a consultation for sleep apnea treatment.